Dr. Ditunno serves as an Investigator for the Regional Spinal Cord Injury Center of the Delaware Valley (RSCICDV). 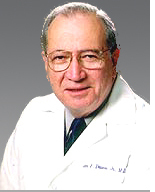 He is former Michie Professor and Chairman of the Department of Rehabilitation Medicine (1969-1997) at Jefferson Medical College, Thomas Jefferson University and former Project Director (1978-2006) of the RSCICDV. He is past president of the American Spinal Injury Association (ASIA), the Association of Academic Physiatrists and the American Academy of Physical Medicine and Rehabilitation (AAPMR). Recognition of his contributions has led to the Krusen Gold Medal of the AAPMR; the Heiner Sell Lecture and Life Time Achievement Award of ASIA and the Silver Medal and Sir Ludwig Guttmann Lecture of the International Spinal Cord Society (ISCoS). Dr. Ditunno has served on peer review panels and advisory committees for various federal agencies including the Rehabilitation Services Administration, NIDRR, NIH, the Institute of Medicine and the Centers for Disease Control. Recognized as a leader in the field of spinal cord injury care, education and research, Dr. Ditunno has authored or co-authored more than 150 scientific papers. He currently serves as consultant and on the the Data Monitoring Committee to a number of clinical trials in SCI. Through his leadership, the RSCICDV is recognized as one of the foremost in the world in the use of outcome measures to predict recovery in walking and arm function.